Q: MITES, SQUIRTS, PEEWEES…WHAT DOES IT ALL MEAN? 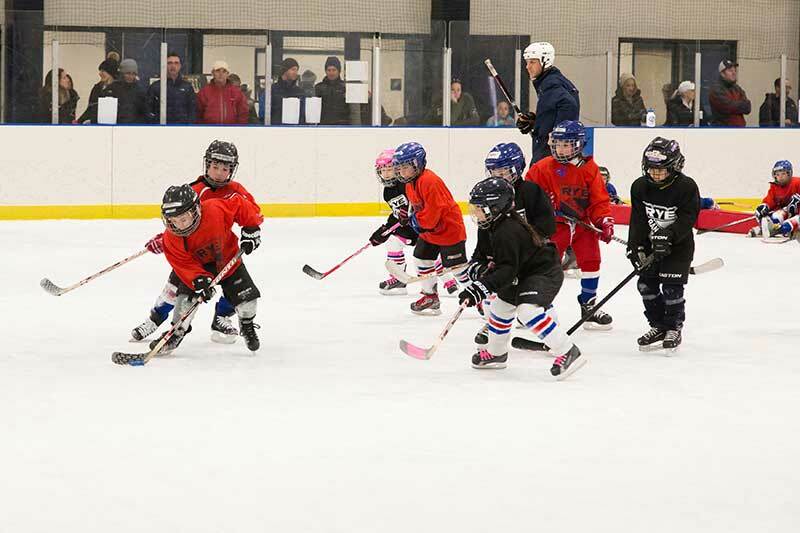 A: The age groups for youth ice hockey can be confusing to navigate. The Rye Rangers use the common system of names that can be found across the country and in Canada. Ice hockey places players in each group via their actual birth year. A player born on January 1st is considered the same age as one born on December 31st of the same year. 8U Mites - All players age 8 and under. Players from 5-8 years old. The only age group that a player will spend more than two years in. Games are played in cross-ice or half-ice configurations. 10U Squirts – All players aged 9 and 10. Plays full ice games. 12U Pee Wees – All players aged 11 and 12. No body contact or checking allowed. 14U Bantams – All players aged 13 and 14. Body contact and checking is allowed at this age. 16U Midgets – All players aged 15 and 16. Q: WHY DO ALL 8U MITES PLAY CROSS-ICE? USA Hockey is a pioneer in this field. Several other sports have now followed suit. Baseball, soccer, tennis and football are all using smaller field/playing surfaces. Q: SHOULD MY KID PLAY ICE HOCKEY ALL YEAR LONG IF HE WANTS TO GET BETTER? Q: IF MY PLAYER MISSES A PRACTICE HERE OR THERE, THAT’S OK IF THEY STILL MAKE THE GAMES, RIGHT? A: Games are fun, and we all love to compete, but for a player’s development, there is no substitute for practice. Many studies have been done in the last decade and have proven that the average youth player touches the puck for less than 60 seconds in a typical game. It is impossible to become a highly-skilled player in 60 seconds or while being active for 15-17 minutes per game. Just showing up for games will not be enough to improve your player’s technical or tactical skills. One efficient practice will equate to approximately 10 games in terms of skill development. We agree with USA Hockey’s preferred 3:1 or 2:1 practice-to-game ratio. Our teams benefit greatly from our weekly practice sessions along with our Erik Nates skills sessions. If your player misses out on any of these sessions they miss a great chance to improve their overall skill level while all other players are working on theirs. Q: CAN OUR SEASON BE SUCCESSFUL IF WE DON’T WIN A LOT? -- It places a higher value on results over effort. -- It tilts the emphasis away from development of every player and toward the scoreboard. -- It makes the better players feel as if they have to carry the team which can lead to selfish habits and attitudes. -- It marginalizes the kids who work hard all year. As the season progresses, you’ll see other teams might leave their best players on the ice more while we try to distribute ice team evenly until the very end of games. You also might notice our practices tend to focus more on skills and small-area games and less on “systems” work like power play and penalty kill. Again, it’s because we want to focus on developing better hockey players and not just do what is required to win every game. In the long run, we’ve found this approach leads to greater team success anyway, and that the occasional loss makes us better. Q: WHY IS RCDS SO COLD? AND WHY CAN’T I PARK RIGHT IN FRONT, JUST FOR A MINUTE TO PICK SOMETHING UP? A: The rink at RCDS is one of the coldest places around. The bitter temps keep the ice surface hard and fast. It is simply some of the best ice in this area. The coned/roped off areas in the parking lot are to be kept clear at all times. There are many school activities going on all throughout the week along with our Rye Rangers scheduled practices and games. The staff must keep these areas clear so that emergency vehicles can have access to the buildings if they are needed. Keep in mind that we are guests when we visit RCDS. Let’s follow their rules. Q: WHAT IS GENERAL SKATING AND WHY DOES COACH JAY ALWAYS ENDORSE IT SO MUCH? A: General Skating is simply an hour of free ice for you and your family to enjoy skating. It is offered to RCDS and Rye Rangers families on Fridays from 3:30-4:30 and Sundays from 3:00-4:00pm. The reason Coach Jay loves to send reminders is that every hour on skates is an hour your player is improving his Agility, Balance and Coordination (ABCs). Every hour your player is on skates is an hour your player improves their edgework and gains confidence on the blades. It is the only time your player will not have a coach barking instructions while they are on the ice. Take advantage of it.